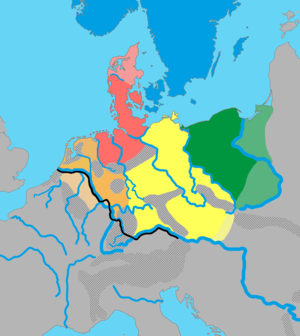 North Sea Germanic, also known as Ingvaeonic /ˌɪŋviːˈɒnɪk/, is a postulated grouping of the northern West Germanic languages, consisting of Old Frisian, Old English and Old Saxon and their descendants. Ingvaeonic is named after the Ingaevones, a West Germanic cultural group or proto-tribe along the North Sea coast, mentioned by both Tacitus and Pliny the Elder (the latter mentioning that tribes in the group included the Cimbri, the Teutoni, and the Chauci). It is not thought of as a monolithic proto-language but rather as a group of closely related dialects that underwent several areal changes in relative unison. The grouping was first proposed in Nordgermanen und Alemannen (1942) by German linguist and philologist Friedrich Maurer as an alternative to the strict tree diagrams that had become popular following the work of 19th-century linguist August Schleicher and assumed the existence of a special Anglo-Frisian group. The other groupings are Istvaeonic, from the Istvaeones, including Dutch, Afrikaans and related languages; and Irminonic, from the Irminones, including the High German languages. The so-called Ingvaeonic nasal spirant law: converted *munþ "mouth" into *mūþ (compare Old English mūþ). Several, but not all, of the characteristics are also found in Dutch. It did not generally undergo the nasal spirant law (except for a few words), it kept the three plural endings distinct and it did not have the -s plural. However, it underwent near-full monophthongisation (some instances of -ei- persisted), lost the reflexive pronoun (even if it later regained it by borrowing) and had the same four relic verbs in weak class 3. ^ Hammarström, Harald; Forkel, Robert; Haspelmath, Martin, eds. (2017). "North Sea Germanic". Glottolog 3.0. Jena, Germany: Max Planck Institute for the Science of Human History. ^ Harbert, Wayne (2006). The Germanic Languages. Cambridge University Press. p. 179. ISBN 978-0-521-80825-5. ^ Harbert (2006), pp. 7–8. Bremmer, Rolf H. (2009). An Introduction to Old Frisian. Amsterdam: John Benjamins B.V. ISBN 978-90-272-3255-7. Euler, Wolfram (2013). Das Westgermanische - von der Herausbildung im 3. bis zur Aufgliederung im 7. Jahrhundert - Analyse und Rekonstruktion (West Germanic: from its Emergence in the 3rd up until its Dissolution in the 7th Century CE: Analyses and Reconstruction). 244 p., in German with English summary, London/Berlin 2013, ISBN 978-3-9812110-7-8. (in German) Maurer, Friedrich (1942) Nordgermanen und Alemannen: Studien zur germanischen und frühdeutschen Sprachgeschichte, Stammes- und Volkskunde, Strasbourg: Hüneburg. Ringe, Donald R. and Taylor, Ann (2014). The Development of Old English - A Linguistic History of English, vol. II, 632p. ISBN 978-0199207848. Oxford. (in German) Sonderegger, Stefan (1979). Grundzüge deutscher Sprachgeschichte. Diachronie des Sprachsystems. Band I: Einführung – Genealogie – Konstanten. Berlin/New York: Walter de Gruyter. ISBN 3-11-003570-7. Voyles, Joseph B. (1992). Early Germanic Grammar: Pre-, Proto-, and Post-Germanic. San Diego: Academic Press. ISBN 0-12-728270-X.